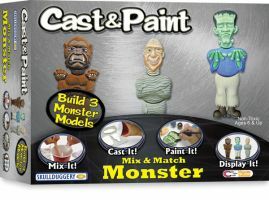 Frankenstein, the Mummy, and a Werewolf are waiting - in the Cast & Paint Monster Casting Kit! Make your very own monsters, then paint in their scary details yourself. Once they're done, you can play with them, or display them - even stick them to the fridge with the included magnets! Casting Kits make great parent-kid activities, too!.Take a look at PerfectCast, the ideal accessory for any casting kit - more casting material!